Kitchen islands will always be on trend. But how homeowners utilize them is another story! In 2017, we saw a lot of moving islands and islands with built-in seating. These aren’t going away anytime soon, but there are new and exciting ideas that we predict will make a major statement this year. Apart from enhancing their aesthetic appeal, designers are now trying to include as many efficient functionalities to kitchen islands as possible. 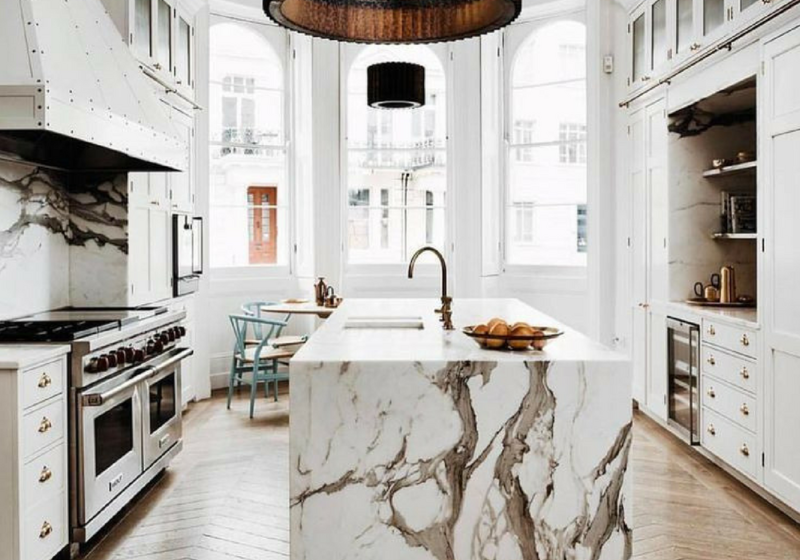 Take a look at some of the kitchen island design trends that are likely to rule kitchen remodeling in 2018. Kitchen islands aren’t just for cooking and chopping! As we enter 2018, integrating technology into interior design has never been more at the forefront. You’ll see homeowners craving kitchen islands that can double as a technology hub for their family. Think: custom-built storage for laptops, tablets, and charging stations. This comes to us as no surprise, as the kitchen tends to be Grand Central Station for most families. Don’t forget about music! Islands can be equipped with state-of-the-art speakers so you can play tunes while you whip up your next meal or entertain friends. Everywhere you looked in 2017, marble was sure to be found. While we don’t believe the classic appeal of marble will ever go out of style, there is a new, more versatile sheriff in town - Terrazzo. 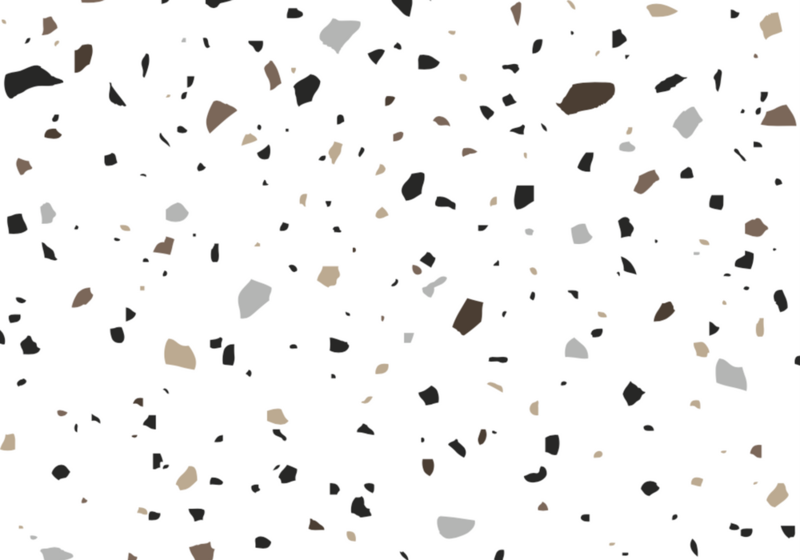 Being praised for it’s versatility, Terrazzo can be styled with an understated vibe, or in a colorful maximalist fashion. 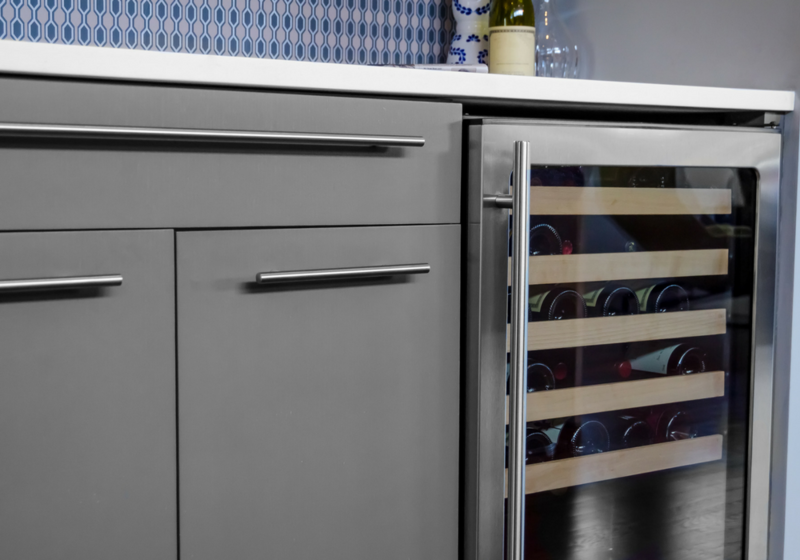 Wine enthusiasts are opting to double down on their kitchen islands by installing built-in wine fridges and racks to store their favorite bottles. We’re sure you’ve seen plenty of added sinks for chilling champagne, wine, or beer - typically adjacent to the sink in a large kitchen island. This trend emerged in 2017 and doesn’t seem to be going anywhere! We’ll toast to that. Keep an eye out for this kitchen island trend in 2018! A waterfall island is a sleek and modern version of your standard kitchen island, but the stone countertop continues from the top and extends on each side, all the way down to the floor. We absolutely love this 2018 trend and hope it sticks around for the long haul. It seems that using the kitchen island counter only as an extra working area isn’t that popular anymore. Instead, we see more and more island counter seating arrangements. While the seating arrangement still covers only one part of the island, the island itself starts to look more like a dining table, with a great portion of its countertop used for this purpose. Although large islands are definitely trending, small kitchens need not shy away. Small space kitchen islands are popping up everywhere, as designers are getting better and better at creating efficiencies despite a lack of square footage. For larger homes, homeowners are opting to double down on their kitchen islands. 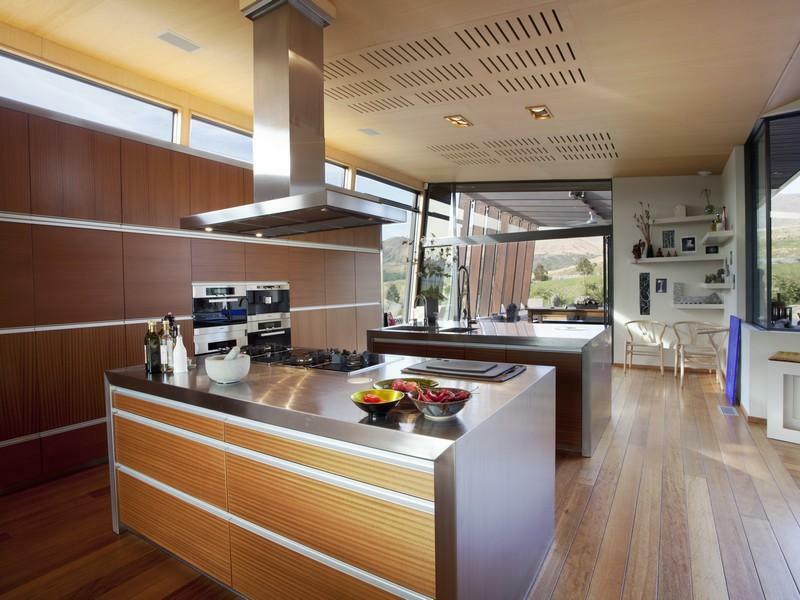 The main kitchen island, closest to the appliances and cooking area, is used mainly for utility. The second kitchen island is typically for added seating. In 2018, you are bound to see homeowners getting extra creative with their kitchen island storage. From sleek pull out drawers to glass display cases to shelving, utilizing the sides of an island to create efficient storage will be all the rage this year. Personally, we’re a huge fan of sliding drawers to store extra kitchen utensils and appliances. Goodbye clutter! Storing household items on the countertops is a thing of the past. Dark, painted cabinets were a huge trend in 2017…with homeowners opting to paint their kitchen cabinets anything from dark slate grey, to navy blue, to deep green. In 2018, we predict that we will see this continue. When it comes to kitchen islands, they don’t have to mirror the rest of the cabinetry perfectly. Two-toned kitchen islands are expected to be a major trend, and will add interesting dimension to beautiful kitchens. Ready to Update Your Kitchen Island in 2018? The kitchen is, without a doubt, the most important room in a home. 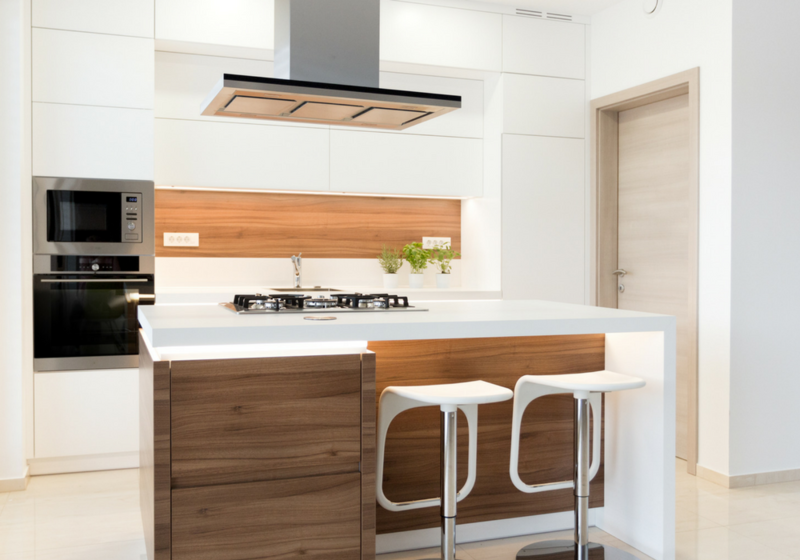 There are so many reasons to spruce up a kitchen, but its design can hold serious weight when it comes the overall value of your home. Keep these kitchen island trends in mind as you gather inspiration for your 2018 kitchen remodel. When you need help, just let us know!